Utilities for even more powerful web browsing. Search all open tabs, retrieve previously closed tabs, and make notes! This is an alpha version. More work on it soon.Your browser needs to have a sidebar enabled to use this extension. 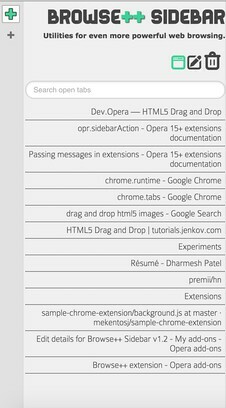 Try the latest version of 'Opera Developer'. If you look at the navigation menu on the top, then the left most icon is where you find the options to see all your open tabs. Just hover over that icon and then it will appear. You can also search your tabs (it will search the title and the URL). Clicking on a tab's title will make that tab the visible one. You can make simple notes (very similar to the way you made notes in the Presto based Opera) . The icon is the second from the left, just hover over it to see note interface come up on the left hand side. You can add notes. Important: Whenever you either add a note or even edit it, make sure to click the 'save note' button, otherwise it will not be saved. Also, while I encourage you to make notes, please do not put any super sensitive or critical info in the notes. It is not secure by any means, and if you uninstall the extension and then later install it back, your previous notes will not be there anymore. So try to use notes for info which is not super sensitive or critical. You can get a list of your last 50 closed tabs. The right-most icon gets you the 'Trash Can' which lists it. You can also search your closed tabs by entering the search terms in the search box. It will search it by title and URL.